Fall River, July 31, 1892. Alexander Pittsley and Charles Hersom and his wife, Jane Elizabeth, each more than 70 years of age, who live at Slab bridge, Freetown, were yesterday locked up in the central police station. Pittsley has, up to within six months, lived a sort of hermit’s life. He resided in small hut and earned his living by doing odd jobs. About six months ago, Hersom and his wife came here from Norton , and established themselves at Slab bridge. The wife pitied Pittsley so much that she urged her husband to let the old hermit become a member of the family circle. This was done and all went swimmingly for a while, until it became apparent to Hersom that his wife and Pittsley had fallen in love. A row ensued and Hersom was fined for assault and battery on his wife. This was about a month ago. Just after the trial, Pittsley, who still remained at the house and Mrs. Hersom eloped, taking the husband’s horse and wagon and a load of his household goods. They established themselves in Norton. Hersom was evidently content to get rid of his erring spouse, for he made no attempt to follow them. Friday night, however, Pittsley and Mrs. Hersom came back to the Slab Bridge home for another load of furniture. The wagon was piled high with goods and the rig hidden away in the woods. Then Pittsley and Mrs. Hersom paid a visit to the Pittsley hut. They found Hersom there. The two old men began a bloody fight and Hersom was badly battered about the face and had an arm injured. He was almost killed. Pittsley and his companion became alarmed at the condition of the deserted husband, and started off on the road to Taunton, while Hersom sought Officer Marble. The officer captured the couple after a lively chase of three miles.They had become weary and were resting at the roadside when they were placed under arrest. The quartet came to this city yesterday, Pittsley and Mrs. Hersom being handcuffed. Hersom’s arm was in a sling and his face was decorated with cuts and sticking plaster. Pittsley is well known to the police here having been arrested for minor offences. The exact nature of the charge to be preferred against him is unknown. While the 1892 press hyped this incident and played it for laughs, I was moved that a man and woman in their seventh decade of life, were alive to love, and new possibilities. (I will concede that taking off with the horse, wagon, and household goods was not the most honorable exit strategy.) I wanted to know what happened to Charles H. Hersom, Jane Elizabeth Hersom, and Alexander Pittsley. That Pittsley “almost killed” Hersom is hyperbolic. The article portrays him as ambulatory, with an arm in a sling and minor facial wounds. And Hersom was a soldier in the Union Army, with the Massachusetts 4th Regiment of Infantry; he must have gotten a few licks in on Alexander. Furthermore, we are told the month before, Charles Hersom was fined for beating up his wife. And yet, the Second District court sentenced the abused wife, Jane Elizabeth Hersom, to two months, while Alexander Pittsley was sent away for four months to the House of Correction for assault. After that, Jane Elizabeth Hersom disappears from record. Charles H. Hersom, stays around for a long time. About four years after the incident, in 1897, Charles H. Hersom married wife number three, Margaret (Cunningham) Lester. He was 75 and she was 37. Margaret bore him four daughters, in addition to three children he had with wife number one, an Irish lass named Mary. He married her in 1864 and the family were living in Canton, Massachusetts for the 1870 census. Charles liked lived in Freetown with his new young wife and kids until 1913, when after a six-day bout with bronchitis, he died, at 93 years of age. 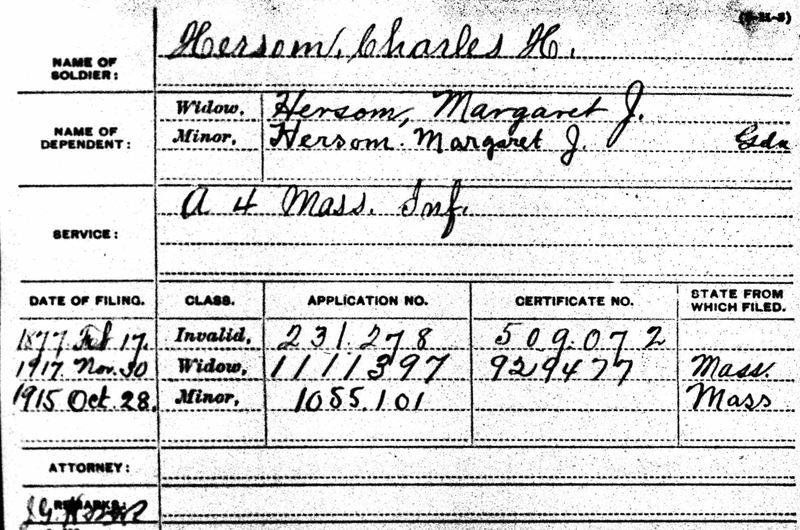 Index card shows Charles H. Hersom got an Invalid pension in 1877; his minor daughter got a benefit in 1915 and wife Margaret collected a widow’s pension in 1917. For Alexander Pittsley, who served the harsher sentence, life was rarely kind. That he lived in a hut “like a hermit” and had been “arrested for minor offences” are clues that he suffered some form mental illness that kept him on the margins of society. On November 4, 1898, at 74 years and 10 months, Alexander starved to death “off Summer Street” in the town of Foxboro. I want to think that Alexander and Jane Elizabeth, who discovered love in winter, were able, at least for a moment, to find joy in each other. This entry was posted in American history, Hersom family history, local history, Pittsley family history and tagged Freetown, Massachusetts, Massachusetts genealogy, Massachusetts history, Nineteenth century crime and punishment by poorirish. Bookmark the permalink.